The Official Inauguration of "The Scent of Christ Church" will take place on the 9th of July 2017. The church is pastored by Sola and Simi Mabogunje. They have functioned together as seasoned marriage counsellors for over Fourteen (14)years. They have been happily married for twenty two Years (22) and together bring a wealth of experience to the table when counselling. Sola Mabogunje started his service to God as a member of a music group and then became a Worship Leader. He functioned in this capacity for quite a number of years while on campus and in some well known Churches in Lagos, until the Lord anointed him with a teaching gift. He served the Lord in Daystar Christian Centre under the Leadership of Pastor Sam Adeyemi for Sixteen(16) years in various capacities as a Marriage counsellor, President of an impactful ministry to men and as a Zonal Pastor. Professionally he is an Engineer and the CEO of a successful IT solutions Company in Lagos for over nineteen (19) years. 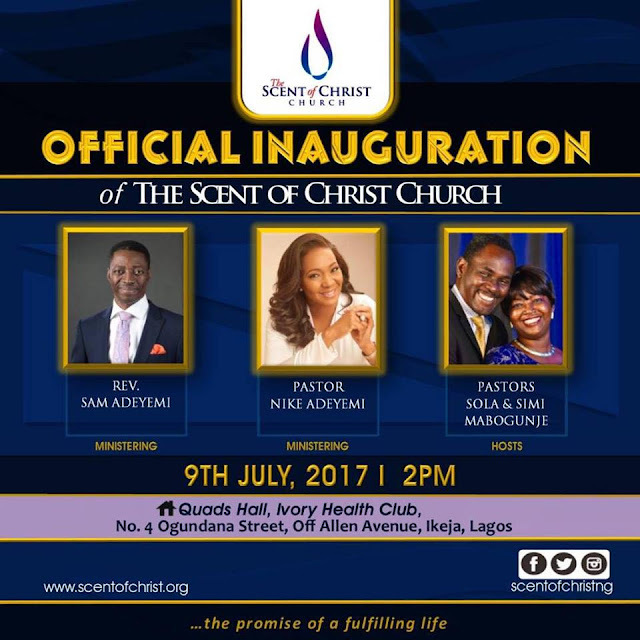 Simisola Mabogunje is the director of the Children’s ministry of The Scent of Christ Church. She is also a professional administrator and a Chartered Secretary. Simi currently works as an admin consultant for Schools and Corporate organisations. She served the Lord in the Junior Church of Daystar Christian Centre for about Sixteen (16) years. Reverend Sam Adeyemi and Pastor Nike Adeyemi will be ministering.